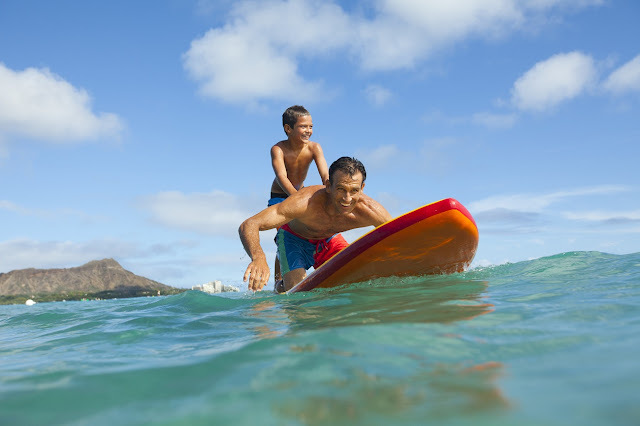 A GEEK DADDY: Save $100 on family-friendly Hawaii vacations with Pleasant Holidays - USFG's new travel partner! I've partnered with the US Family Guide blogger community for a few years now on a variety of projects and always enjoy sharing with you when they give me a heads up on an interesting opportunity. I just learned that US Family Guide has partnered with Pleasant Holidays, a leading provider of package vacations. I've always wanted to go on a vacation to Hawaii and just haven't had the chance to make that happen yet. If you've also been dreaming of a Hawaiian getaway, Pleasant Holidays can help make that trip a reality. Pleasant Holidays currently has a great deal on Hawaii vacations that saves you $100 per booking. Select from 26 hotels and resorts on the four most popular islands: Oahu, Maui, Kauai and island of Hawaii. Explore the exciting sights of Oahu, including world-famous Waikiki Beach and historic Pearl Harbor. Watch the sun rise from the slopes of a dormant volcano on Maui. Snorkel, hike, kayak, surf, experience Polynesian culture and more. This deal is valid on new vacations booked by 10/30/16 for select travel through 6/30/17 that include roundtrip airfare from the continental United States and a stay of five nights or longer at a participating hotel or resort. The $100 savings is per booking and taken at time of booking - no waiting! For more information or reservations visit PleasantHolidays.com, call 1-800-837-5154 or contact your travel agent. Pleasant Holidays is new to US Family Guide, but has been partnering with hotels and resorts for more than 55 years to get great offers you cannot book anywhere else. They're based in the U.S. and have great deals on family vacations worldwide - Hawaii, contiguous United States, Canada, Mexico, Caribbean, Costa Rica, Europe, Tahiti, Fiji and more. They can also book complete cruise vacations with airfare, onboard accommodations, and pre- and post-cruise hotel stays for vacations where everyone can relax and enjoy. When you're planning to explore close to home or farther afield, make them your one-stop-shop for everything you need: flights, accommodations, car rentals, ground transfers, exciting activities and tours, and travel protection coverage to protect your travel investment (because if parenthood has taught us one thing, it's to expect the unexpected). And unlike some other online travel providers, they have in-destination customer assistance should you need it.